The 5 Coolest New Parks and Public Spaces In the U.S.
Urban Land Institute has announced its Open Space Awards, celebrating five exceptional new parks and public spaces across the U.S. But what's even more exciting is what these green spaces replaced: A freeway, a mall, a truck-loading facility, a rail yard, and a cemetery. The criteria for ULI's Open Space Awards are not just aesthetic but also financial; they're looking for "successful large- and small-scale public spaces that have socially enriched and revitalized the economy of their surrounding communities." These public spaces are not only providing sunlight and greenery in downtown cores, now they're also acting as economic engines for their cities. It's hard not to get excited about any freeway cap park, but this 5.2-acre swath in Dallas designed by The Office of James Burnett is particularly transformative. 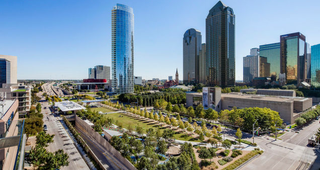 Soaring over the Woodall Rodgers Freeway, Klyde Warren Park connects two formerly divided neighborhoods, delivers much-needed recreational space, and provides programmed activities that make it feel like a town square in the center of the city. All while cars zoom beneath. In a plan to develop its downtown, Columbus ended up getting two parks: Columbus Commons replaced a former mall and Scioto Mile narrowed a nearby street and improved a waterfront park that was already there. Now almost 18 acres of park include gardens, trails, cafes, a carousel, and a performing arts center with a massive—15,000-square-foot!—interactive water feature. A 2.6-acre plot used to be home to a truck loading facility, until it was recast as a small but lively park. There are other environmental improvements to the former industrial site: Bioswales were installed to help filter groundwater, and its geothermal heating is distributed to nearby buildings.The space is now the center of an emerging arts district as well. In a city that's synonymous with train travel, the historic railyard has always played a big role, but in recent years it had fallen into disrepair. Where trains were once serviced, now there's a thriving commercial hub with galleries, museums, a farmer's market, brewery, restaurants, and retail. Plus, a new commuter rail hub is at the heart of the space, ushering in the new era of transit. When this former cemetery was first turned into a park (the remains were interred elsewhere), the site suffered from so much neglect that it became a harbor for illegal activity. This makeover of the 8-acre site provided a much-needed boost to its identity by partnering with a local development corporation to improve the surrounding neighborhoods as well. Now there's a great lawn, water feature, playground, and dog park.